Clad in gleaming high-tech armor, billionaire industrialist and genius inventor Tony Stark takes off on his next mission as Iron Man! This member of the Avengers is genuinely devoted to making the world a better place. 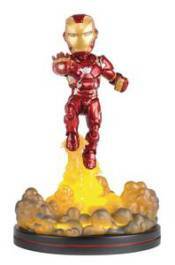 Iron Man's plume of jet exhaust lights up (batteries included) with a fiery golden glow in this Q-Fig FX diorama. Special metallic paint gives his armor a brilliant sheen. This version of the superhero stands about 5 1/2' tall and is featured in the Marvel movie Captain America: Civil War. Iron Man is just one in the series of Marvel Q-Figs, so be sure to check out the rest of our amazing superheroes and villains!